All of the liquid lipsticks above are both cruelty free and vegan but the way they’re formulated and the way they feel is all completely different. Lime Crime: Pigmented and has a smooth application. The wand gets messy very quickly grabbing way more product than you need each time. Kylie Cosmetics: The liquid lipsticks smell soooo amazing like a strong scent of vanilla. I know not everyone is into lipsticks having a scent but it doesn’t last on the lips long. The product itswlf is pigmented so it’ll only need one layer (anything more will make it feel more dry and thick. It will crack with more layers). It is actually very comparable to the Colourpop Ultra Matte loquid lipsticks so if you get the kit, the lip liner really helps… or any lip liner for that matter. 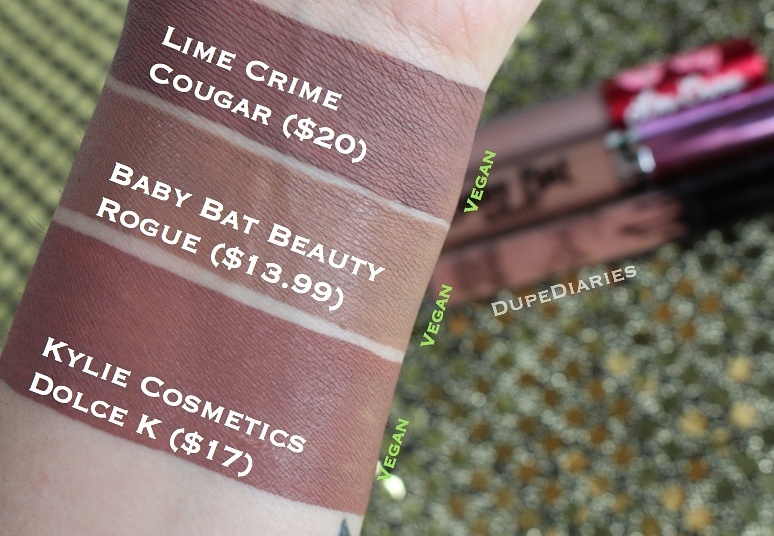 Overall I think the Baby Bat Beauty liquid lipstick is the most worth getting of the bunch.